Debt settlement is a complex process that requires expert guidance in order to ensure success. Here at A New You, we recognize the impact that debt has on the individual. We know that debt can impact a person’s life in many ways – preventing them from achieving their goals and stopping them from enjoying their day-to-day family life. It’s the reason we’ve developed an expert debt settlement service. We can lead debt settlement negotiation with the creditor, and can help all clients achieve respite from their financial challenges. Our experience is second-to-none in the industry, making us the best debt settlement company for a seamless resolution. For those who are assessing their debt challenges, relief begins today. Is Debt Overpowering Your Life? Debt settlement is the process of negotiating with the firm that holds the debt to lower the obligation to an affordable amount. One of the foremost advantages of the debt settlement process is that it offers an aggressive approach to reducing debt. This makes it one of the best approaches to debt relief for many people. The process of debt settlement typically lasts from 1-to-4 years depending on the level of debt the person holds. This length of time allows for effective debt settlement negotiation and ensures the debtor can work with their creditors to reduce their overall debt burden. In order to fully consider all avenues for debt relief, it’s important to compare the debt settlement process to other debt relief strategies. Let’s examine the most popular options for reducing debt. Which Is the Best Settlement Option for You? Unfortunately, there is no one size fits all option for debt resolution. Each debtor has a unique financial situation that requires a customized approach to the debt resolution process. Individuals must analyze the various options alongside a specialist and then complete the research to ensure the right choice for their own financial future. Why Choose A New You For Debt Settlement Services? One of the more common challenges that those in debt face as they try to address their financial issues is that the company supposedly helping them in the process is taking away the little money available to them. A New You is a customer-focused organization and is 100% committed to helping each individual reduce their debt burden. This means that we don’t charge any up-front fees for our service expertise. We are one of the few debt settlement companies in the industry to structure our services in this way. Because the team here at A New You understands the many issues that those in debt face, we ensure that our fees are secondary in the debt settlement negotiation process. We only collect our fees when the client’s debt issues are resolved. Not only does that ensure that clients don’t incur any further costs while trying to address their financial challenges, but it also helps relieve some of the stress of the debt settlement process. Instead of having to scrape together their dollars to pay us, clients can work with our experts directly to devise a strategy that ensures financial success over the long-term. A primary reason so many people are now working with A New You is because of our level of front line debt settlement experience. We’ve proven our understanding of market dynamics and financial management by helping thousands of clients reduce their debt burden over time. Our programs are driven by experienced professionals with a clear understanding of the marketplace. Also, each of the specialists we employ is committed to seamless communication with our clientele. They can respond to any inquiries by harnessing their understanding of the industry and providing concrete answers to questions posed by clients. This helps form the basis of a personalized debt relief program that ensures the person achieves financial security in the coming years. We’re not in the business of offering inflexible debt relief solutions to our clients. We know that each client is unique and has their own unique financial challenges. This means we’re able to offer each client a unique debt settlement program according to their long-term financial targets and their current issues. Each program is coordinated alongside the client’s debt settlement analyst. They will provide options for a monthly dollar amount to set aside. They will also offer options for the length of the program. A New You can provide debt settlement programs that range between 12 months and 48 months in length depending on the type of financial challenges the client is facing. As part of the program setup process, the A New You analyst will guide the client in terms of their expectations and help them finalize the enrollment process. Our trusted team has a clear understanding of the debt settlement negotiation process. We work with the client’s creditors to help ensure that the debt burden is reduced over time. 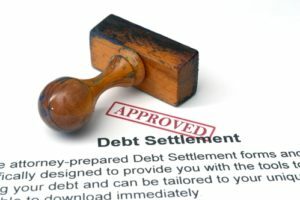 As one of the preeminent debt settlement companies in the business, we understand the negotiation process, and we can deploy many of the most successful techniques to ensure debts are reduced while reducing harassment of the debtor by their creditors. This process helps give our clients confidence in our services and ensures they achieve hope for their individual financial future. Those in debt can often feel alone when trying to handle their money issues. They may experience a higher level of stress or even depression when they consider the amount of money they owe to various parties. This is an issue that must be taken seriously. And contacting the trusted team here at A New You is the best first step to show a commitment to debt resolution. Don’t take on this challenging process alone. A New You is here to help ensure debt settlement success! The team here at A New You is ready to help those in debt achieve their financial freedom and resolve their debt issues. We have both the experience and the expertise to ensure the right solution is found for each individual client. Clients can begin this process today by calling our team directly. A group of experienced debt settlement professionals is available on short notice to answer any questions and to begin a settlement process that helps ensure the client’s financial freedom for the long-term future. Begin today by reaching out to our team directly for a free quote at 1-855-501-6870. Today is the ideal day to take that first step towards debt relief. ©2019 A New You. All Rights Reserved.